October is Breast Cancer Awareness month so Sandy Pawz Dog House is going pink and you and your dog can join us! you can show your support by requesting the Breast Cancer Awareness pink ribbon colored on your dog’s fur for $5.00, with all proceeds going towards Breast Cancer funding. If you’re feeling very supportive, you can also have your dog’s nails painted pink for $11.00 ($5.00 will go towards Breast Cancer funding). Also, if you buy a pink leash or collar in the month of Octobe we’ll take 5% off the retail price. So let’s get pink together and support Breast Cancer Awareness. Here we go again: Fire Season. In Southern California those are scary words, so it’s smart to be prepared, for yourself and your pets. In case of an evacuation, plan ahead. Figure out now where you’ll stay whether it’s with family, friends, or a pet friendly hotel. Remember many emergency shelters won’t allow animals. Also, be sure to pack an emergency bag for your pet. You’ll want to inclue vaccination records, medicines, ID tags, collars, leashes, enough food for a few days, bowls, and a pet carrier/crate. The more prepared you are, the easier it will be in an emergency. 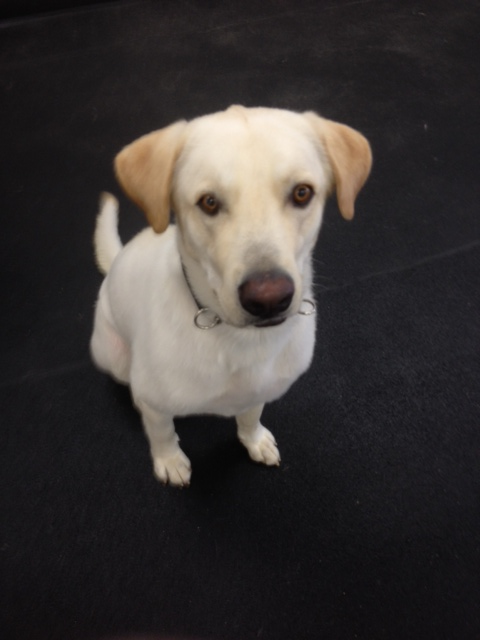 Riley DeGrace is a Labrador that comes to us for daycare and an occasional groom. Riley is always happy and ready to play with 4 footed or 2 footed friends. Riley’s good friends include Skylar (a Doberman), Oliver (a Goldendoodle), and Nick (a Chihuahua). Sometimes dogs will decide that they need to guard their “resources”. This could be their food, a bone, a toy, or your sock that he/she has decided belongs to them. If you can catch the guarding behaviors before they get to the “growl and snap stage”, it’s much easier to extinguish the behavior. Signs to look for include: 1) The dog places its feet around the object. 2) The dog leans over the object. 3) The dog blocks you from getting the object. If you are seeing these behaviors, it’s time to take control. As always, if you have questions, feel free to contact us at 760-739-7299. It’s our third annual Halloween Pet Picture Costume Contest! Submit a picture of your costumed pet on our Facebook page (Sandy Pawz Dog House) to enter. Categories include: Cutest, Scariest, Most Creative, and Facebook Fan Favorite. At the close of business on Halloween night, Sandy Pawz Dog House staff will choose winners for Cutest, Scariest, and Most Creative. The Facebook Fan Favorite will be the pictures with the most likes. We can’t wait to see your pictures. Don’t forget…boarding space at Sandy Pawz Dog House is limited and we’ve already starting taking reservations so call early to reserve your spot! And remember our facility is one of the few you will find that has an overnite attendant EVERYNIGHT! $42 a nite for 25lbs and under, $52 over 25lbs. includes full day of day care and no extra charges!